The annual meeting is coming up on May 15, 2018. I voted with the Board’s recommendations 60% of the time. View Proxy Statement via SEC’s EDGAR system (look for DEF 14A). From the Yahoo Finance profile: The Charles Schwab Corporation’s ISS Governance QualityScore as of April 1, 2018 is 9. The pillar scores are Audit: 1; Board: 8; Shareholder Rights: 9; Compensation: 9. Egan-Jones Proxy Services recommends “For,” all board nominees. However, E-J noted this is a classified board with several directors considered affiliated who E-J would recommend against if up for reelection. Since I voted against the say-on-pay, I also voted AGAINST all members of the compensation committee up for election: Joan T. Dea. I have no reason to believe the auditor has rendered an inaccurate opinion, is engaged in poor accounting practices, or has a conflict of interest. However, Egan-Jones notes that Deloitte & Touche, LLP has been serving as the Company’s auditor for seven years and their independence is compromised. They also several other issues. I also believe that the companies should consider the rotation of their audit firm to ensure auditor objectivity, professionalism and independence. I have not set a specific number of years. In this case I voted FOR. Charles Schwab’s Summary Compensation Table shows the highest paid named executive officer (NEO) was CEO Walter W. Bettinger II at $14.3M. I’m using Yahoo! Finance to determine market cap ($79B) and I am roughly defining large-cap as $10B, mid-cap as $2-10B, and small-cap as less than $2B. Charles Schwab is a large-cap company. According to the Equilar Top 25 Executive Compensation Survey 2015, the median CEO compensation at large-cap corporations was $10.3M in 2014, so pay was over that amount. Charles Schwab shares outperformed the Nasdaq over the most recent one, two, and five year time periods. It also appears on As You Sow‘s list of the 100 Most Overpaid CEOs. Prior reports have shown that being on that list is correlated with lower returns in subsequent years. The ratio of the annual total compensation of the CEO to the median of the annual total compensation of all employees was 146 to 1. Egan-Jones Proxy Services takes various measures to arrive at a proprietary rating compensation score, which measures wealth creation in comparison to other widely held issuers. 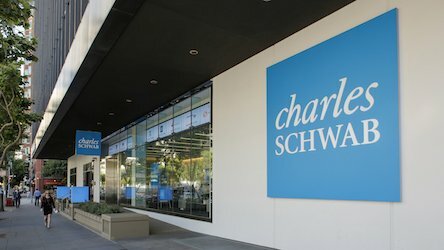 “Superior” is their rating given on compensation issues for Charles Schwab and they recommend For the say-on-pay item. I voted “AGAINST” the say-on-pay item and the members of the compensation committee. Frankly, I was not sure how to vote on this one. Since E-J and most institutional investors disclosing their votes voted FOR, I did as well. Last year shareholders overwhelmingly voted in favor of a proposal seeking proxy access, submitted by Scott M. Stringer, Comptroller of the City of New York… so our board did not come up with the idea without shareholder initiative. However, some credit is due, since the proposal calls for shareholders to be able to nominate up to 2 or 25% of the board. That is better than a frequently used standard of 2 or 20%, Still, the proposal is definitely ‘lite,’ since it limits nominating groups to 20 members, instead of having no cap. I voted FOR, since it represents progress. This proposal, submitted by Scott M. Stringer, request the Company to disclose annually its EEO-1 data – a comprehensive breakdown of its workforce by race and gender according to 10 employment categories – on its website or in its corporate responsibility report, beginning in 2018. Diversity matters. I do not believe a proposal like this must be justified on economic grounds, since it is so obviously the moral choice. However, the proponent cites several studies supporting the proposal on the grounds that it is likely to lead to higher returns. Vote FOR. This is my proposal (James McRitchie), so of course I voted FOR. The proposal is good governance, simply requesting a report to account on political spending. It would do nothing to prevent any such spending. As I have reminded readers in previous posts, the US Supreme Court’s decision in Citizens United v. Federal Election Commission was based on a false premise. Justice Kennedy’s majority opinion justifies the decision by pointing to the Internet. And the Court expressed enthusiasm that technology today makes disclosure “rapid and informative.” Yet, corporations are notrequired to make the disclosures of lobbying expenditures and political contributions to shareowners as Justice Kennedy seems to have believed. Vote FOR. As I have reminded readers in previous posts, the US Supreme Court’s decision in Citizens United v. Federal Election Commission was based on a false premise. Justice Kennedy’s majority opinion justifies the decision by pointing to the Internet. And the Court expressed enthusiasm that technology today makes disclosure “rapid and informative.” Yet, corporations are not required to make the disclosures to shareowners as Justice Kennedy seems to have believed. See also Shining a light on corporate spending in our elections. Proxy Democracy is still down. I am starting to look for contributions to bring it back to life. As I write this Proxy Insight had reported on Canada Pension Plan (CPPIB) and Texas Teachers. Both voted in favor of all items, including the shareholder proposals. Calvert voted against two director candidates, Trillium against all. Both voted for the auditor and against the pay item. Trillium voted against the stock incentive plan. Both voted for both shareholder proposals. Supermajority vote requirement (80%) to amend certain charter and certain bylaw provisions.